Next week in Geneva, a prime issue for a UN endangered species committee called Cites will be illegal trade in wild tigers. In this week's Green Room, Debbie Banks argues that a handful of businessmen want to reduce the tigers to nothing more than a luxury commodity. "Bagh Bachao, Jungle Bachao, Bharat Bachao" is the rallying cry of NGOs and activists across India, and they're right: Save the Tiger, Save the Forest, Save India. The future of the tiger and its jungle home are inextricably linked to the survival of all of us, not just the people who live in tiger country. The forests that are protected in the name of the tiger are vital to mitigate climate change and to secure water resources. The tiger is an indicator of the health of the ecosystem and thus a symbol of good governance and political commitment to an equitable and sustainable future. It is also a cultural and religious icon, venerated, feared and revered by communities across Asia and the world. The Environmental Investigation Agency (EIA) has been investigating and exposing the illegal trade in tigers and other Asian big cats for over 10 years. We have documented the changes in the markets and the increasing role of organised criminal networks. We have campaigned for more effective enforcement initiatives to disrupt their operations, and know there is so much more that governments could do if they wanted to. Looking to the future, it is essential to plug some of the gaps in conservation strategies. Many people living alongside tigers have yet to benefit from the millions of tourist dollars that the "world's favourite animal" generates; but in India, home to the largest remaining population of wild tigers, investment, policy and practice are at least moving in the right direction. The same cannot be said for other countries, where business interests are hijacking the tiger conservation agenda, calling for the relaxation of trade bans so they can flood the market with farmed tiger parts. The logic behind such a move is that since tigers breed well in captivity, farming them is an economical solution to satisfying demand whilst alleviating pressure on wild populations. It's a simplistic logic that rests on critical assumptions about the complex nature and dynamics of the illegal trade in tigers and other Asian big cats. Can farming tigers reduce pressure on their cousins in the wild? Assumptions about the motivations of those involved in the trade, the costs of the trade, the scale and type of consumer demand: all plugged in to economic models and squirted out the other side as gospel. What the followers of this faith have failed to acknowledge is that their version of events does not hold true in the real world. The risk of proceeding with this as an experiment is enormous, and the stake is no less than the extinction of the wild tiger. So who are these disciples and what is their motivation? 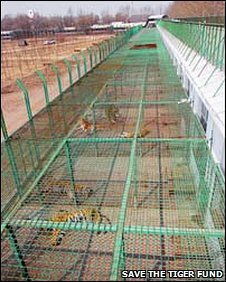 There are tiger farms in Thailand but by far the biggest ones are in China, where there are reportedly around 5,000 animals in captivity. Despite a 1993 ban prohibiting the sale and use of tigers in China, business interests have continued to breed them, speculating that the ban would one day be lifted and that they would be sitting on a valuable stockpile of body parts. Some argue that they want to sell tiger bone to save lives. Yet the Chinese medicinal community has long since promoted alternatives to tiger bone, which was never considered a life-saving ingredient in the first place. Others just want to sell tiger bone wine. In fact, some businessmen are so keen they have already been found in breach of Chinese law, illegally selling the wine in tiger-shaped bottles and in one case, selling tiger meat. EIA and others have found tiger bone wine being marketed as a general tonic and packaged as the gift that wins promotions and seals deals. Call it a conflict of interest, but there has been no meaningful enforcement action by the relevant authorities to stop this trade. The very existence of these farms, and the persistent lobbying of the business community, is a distraction which deflates and undermines real tiger conservation efforts. We're being asked to believe that those who have already dabbled in illegal trade have a real interest in limiting their market, and that the enforcement authorities who have failed to stop them so far will be able to regulate a legal trade to prevent the laundering of poached tiger parts. In June 2007, the international community spoke with one voice; it declared that tigers should not be bred for any trade in their parts and derivatives. Delegates at the 14th meeting of the Conference of Parties to Cites voted by consensus on a decision to phase out commercial tiger farms. The move was championed by the governments of tiger range states such as India, Nepal, Russia and Bhutan, all desperately appealing to the international community to remove the farm threat once and for all. Two years on however, those countries with tiger farms have failed to provide any evidence of progress. In fact, China's response to a notification from Cites seeking information on what steps they have taken to fulfil the agreed decision was met with a curt and derisive response that told us nothing. All eyes will be on China once again during the Cites meeting in Geneva next week. EIA firmly believes that if China is truly committed to saving the wild tiger, it should close down the tiger farms and invest in more effective and meaningful enforcement co-operation with range states. Changes in attitudes and markets show that consumers are responsive to targeted education and outreach, and indeed several markets in China have declined dramatically in the last few years. Now is not the time to abandon efforts but to reinvest, financially and politically, in their continued success. In so doing, we bring far greater benefits - not just to the survival of the wild tiger, but also to other endangered species, to the fight against corruption and organised crime and to a better world for all of us. Who doesn't want that? Debbie Banks is a senior tiger investigator with the EIA. Do you agree with Debbie Banks? Is the international community making headway into protection of endangered species in spite of a thriving black market trade? Does farming of the animals ameliorate the pressure they would otherwise face in the wild, or continue to feed a public appetite for the animals dead, rather than alive? WE farm cows,horses,pigs,chickens,ect. Why not tigers????? Tiger farming is not the solution to the plight of wild tigers. If demand for tiger parts and products is the cause of their current demise, then farming them and reopening of the tiger trade will do nothing but exacerbate the problem. We are talking about 1.3 billion potential consumers, not 10 million or even 100 million! Moreover, Chinese consumers value 'wild' products more than 'man-made' (farmed) ones. So, if the ban on tiger product sale is lifted and 'farmed' tiger products were introduced into the market, it will inevitably trigger a surge in demand for wild tigers. Farming tigers cannot in any way be likened to farming salmon. Salmon is a foodstuff, not a cultural symbol, and is eaten for enjoyment, not to gain strength, cure diseases or any of the other ridiculous things it is claimed that tiger parts & tiger meat can deliver. Tiger farms will NEVER serve to protect wild tigers, because the demand for WILD tigers among the rich is simply too great. It will in fact make it worse - if tiger farming is legalised, who will fund the system for tracing all the worlds' supply of tiger parts? To farm a tiger costs thousands - a bullet in the head of a wild tiger costs next to nothing. Legalising tiger will devastate the few remaining wild tiger populations. And frankly, the loss of any animal species, any where in the world, brings the ultimate shame on the so-called "civilised" species. That's utterly and blindingly obvious. Thomas Goodey : Yes, tigers reproduce well in farms. But no, farmed tigers can never displace wild tigers in the tiger product market, because it costs well over US$ 2,000 to raise a tiger in a farm to optimal size, whereas it costs less than US$ 25 to have one killed in the wild. Closing that gap sounds possible theoretically, but is unlikely to ever happen in practise. Also, consumers prefer wild tiger parts to farmed tigers, for obvious reasons, so wild tigers would actually be at a premium - destroying the pricing logic. More importantly, the logic cited for allowing parts from farmed tigers into the market, is that the free market will then find its equilibrium and price out the illegal market (ie there is some notion of ''justice'' built in to the free market). Well all know how bad the free market is now, at being self-regulatory and just; it is free marketeers who have plunged the world into recession and ruined tens of thousands of lives! The idea that we can rely on market forces to balance each other out and ensure some sort of equilibrium combined with justice, is now thoroughly obsolete. I think those that breed tigers in captivity should be given a taste of their own medicine. They should be kept in cages and bred for a period of time until they understand the magnitude of their crimes against this animal. Maybe then they will stop breeding tigers in captivity. This is an animal that most certainly does not belong in a cage for its life. The ecosystem is, in fact, a carefully balanced system. The loss, or even decrease in population, of any species effects all species. The greed of man is the poison that corrupts our existence. It is this same greed that seeks to control and dominate all living things that needs to be eradicated from mankind. This is a most unfortunate situation. There are many ways to make money without destroying the beauty of the planet. It's a shame that people are limited in their beliefs to think otherwise. Tiger habitat has shrunk to the point that whether we talk of tigers in parks or tigers in farms, we are only debating the size of the cage. The increasing loss of habitat means that over the next century we will be managing the populations of all at-risk animal species. Keeping tigers in naturalistic surroundings may be more pleasing for us and the tigers, but tiger farming is ultimately no more or less immoral than any other animal based agro-biz. If the aurochs had been farmed it would still be around today, and we would be the better for it. why is this such a hard question. 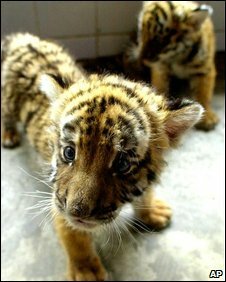 isnt looking at that image of a baby cub enough to convince even the hardest soul, that tigers must live and not be killed for whimsical or even serious consumption. are we that inhumane , that this needs to be debated. what a shame. the chinese better change theri eating habits. this is ridiculous. why must this become a stupid debate. The Chinese people should not be allowed to keep animals at all - wild or tame. They have no alligiance to them, they eat them, mutilate them, and discard them. Put the Chinese people in a cage, and let the animals go free. The world would be a better place. Yes, I most definitely agree with Debbie Banks. The tiger desperately needs new and additional action by governments and organisations, working collaboratively, to ensure the effective enforcement of conservation laws, to stop illegal trade in tiger parts and products and, crucially, eliminate the demand for these products - anything less will see the extinction of these magnificent beasts in the wild within our lifetimes. The few businesses that now seek to start a legal trade are guided exclusively by their commercial interests and, as Debbie Banks points out, they seek to commodify the tiger in order to make a profit and not, as they seek to claim, for the benefit of conservation. The crisis now facing the tiger reminds me of a statement made by Martin Luther King: "Human progress is neither auotomatic nor inevitable. We are faced now with the fact that tomorrow is today. We are confronted with the fierce urgency of now. In this unfolding conundrum of life and history there is such a thing as being too late....Over the bleached bones and jumbled residues of numerous civilizations are written the pathetic words: Too late. We are not yet too late, but very nearly. We need to work together and make sure that there is a complete and lasting end to the trade in tigers and that the few surving wild populations are kept safe in their last remaining habitat. This needs to happen now. I for one call on my government and all in the international community to rise to this challenge. I live at close proximity with these majestic animals. It is not uncommon for the tiger to lift domestic cattles from our area. For a poor villager in these remote parts of north east India, losing a cow is a very rude shock. Yet because of his religious beliefs, he is afraid of hurting the tiger. And he knows killing the tiger is going to bring the wrath of gods to him or his family. But for the Chinese these beliefs hold no value; they are too sophisticated. For this reason, the Chinese govt. should embark on a massive campaign to educate the masses that killing/harming the tiger is going to bring problems for the mankind. Being an authoritian regime, China can really do things if it really wants to. People that hunt tigers for profit, should be shot!! They are an international treasure that will soon be extinct due to ineffective rules and regulations that mean that the local people that make the least money are not scared by killing these wonderful animals. I appreciate that people need to make a living, and that human / tiger conflict is horrific, but they are only protecting what is theirs. People should be educated to a decent standard about medicine, and the environment so that they understand the need for all life to live symbiotically. How are we supposed to feel about this when they are extinct in the wild, and we are no longer able to see them running free. I am not an activist by any stretch of the imagination, and I am a meat eater, but I do not comprehend the callousness of a people that will destroy this creature from the face of the earth, so they can feel powerful. I suggest a change in their thinking, or a harsh punishment, not a fine but lengthy jail terms. This is worse than killing a human, there will be some of them left at least. Farming tigers? I couldn't believe I was seeing what I was reading when I came across this article. It is disgusting, reprehensible, callous, and utterly beyond the pale. Is there anything China doesn't want to consume or exploit? What next human flesh? This only serves to emphasise the threat we are all under from those whose motives are heartless, amoral and nothing less than evil. Debbie Banks has it right and, I am afraid Thomas Goodey from Cuxton-upon-Medway has it blindingly wrong. Here is why. It costs thousands of dollars to feed a tiger and look after it till it is ready to be harvested in a farm. It costs less than a dollar to buy a bullet to kill it. Every tiger in the wild will become a target if the farms start stimulating global demand for tiger skins and parts. By the way Thomas, there are more than a few ways to skin a cat -- deforestation is probably the most effective way. So, when we want to prevent the extinction of the tiger, we include the protection of its forests. Now if we lose those, trust me, the carbon such forest store will end up in the atmosphere... and that will indeed have a very "practical effect on everyone in the developed world too." Thomas Goodey show's his understanding of this situation with this comment "no practical effect whatever upon anybody in the developed countries". Well, without tigers India's remaining forests will be lost, reducing the draw down of CO2 and adding fuel to climate change. Without the forests water resources in India will be badly affected, populations will be put under pressure, conflicts over water will develop, all that in a region with two nuclear powers that already dislike one another!! That scenario will affect developed countries be it the affects of war (possibly nuclear) of mass population migration from a devastated environment. Regarding tiger farms: Well commercial farming of tigers is not just abhorrent; it will not protect wild tigers. In captivity tigers cost a lot to raise due to feeding costs. Wild tigers are fed and mature at no cost thanks to nature. Therefore there will always be a strong commercial reason to poach from the wild as the profit margins will be massive compared to farmed and it will be next to impossible to tell the difference between wild and farmed tiger products. I'm afraid the solution is hard and complex. The governments of the tiger countries must, with assistance from developed countries, preserve and defend the forests and tiger habitats. There must be increased enforcement efforts against the illegal tiger trade, increased protection for tigers, local populations must see the benefits of the tourist trade, and finally every effort must be made to chance the habits and beliefs of tiger consumers. While there are many hard working individuals on the front line of this war to save the tiger, governments can and must do more, and the Chinese government has a massive role to play in this. I'm amazed that it this age of so called enlightenment that anyone still thinks that environment destruction in one part of the world has no implications for the rest of the planet. Debbie Banks has raised a very sensitive issue. The tigers and other wild animals should not be kept in the cages or in the zoos. Forest is their natural home and they should be allowed to live in the forest only with minimum human interference. With the density and area of forest shrinking rapidly, arguments have started that we do not have enough forest to hold the tiger population. It's unfortunate that tigers are being viewed as 'problem animals' and 'men eaters'. This kind of perception may further weaken the position of wild animals. Big effort is needed to check the encroachment of the urban lands in to the forest and to enhance the forest land. The 'market' which deals products of the wild animals must be banned effectively. Tiger farming will NOT stop tiger poaching in the wild. Farmed tigers are fed chickens. CHICKENS!There a massively growing population of rich but unsophisticated people in China, a proportion of who, will insist for, and pay big money for wild tigers. Those ones that eat natural prey. These animals will be considered the premium quality ones. With the remains of one of these WILD animals "on the table", a tasteless Chinese merchant can really demonstrate power, which is his reason for living. I am familiar with the tiger population in Cambodia and there, reading between the lines and the hype, the tiger seems to be already gone. The overwhelming demands of the Chinese economic engine will probably wipe out any remnants of South East Asia's tiger population (At least the tigers disappearance makes more room for leopards!). But saving the Indian tiger and keep the Siberian one going may be realistic. India had 40 000 tigers at the beginning of the 19th century. Today we have about 1400. Which means more or less every day in the last 108 years we have lost one tiger a day. Poaching, man animal conflict...everyone knows the reasons. Why cant we then stop killing of the national animal. The answer seem to be paper tigers. We have covered lots of such wild animals going extinct in our interviews and everywhere the answer reamins unfortunately so common. I do agree that more money needs to be invested to educate people wanting to use the parts of the Tiger for so called "Heath Benefits" and that this would be better spent educating the next generation as they will be the ones that will have the power to do something as they enter the business world. We also need to see more heads of state, people in the public eye and people that have influence on others to take a stand against the distruction of the Tiger, they should not sit on the fence and state their opinion clearly. It's difficult to say whether the international community is making headway into protection of endangered species despite a thriving black market trade. Farming has the danger of opening up new customers and demands which would rather deplete instead of augmenting or preserving the wild species. Improvement of the lot of the poor and marginalized people in the vicinity of as well as within protected areas may serve to make poaching difficult and to that extent help save endangered species. Addressing their needs may need to be prioritised in the larger interest of endangered species conservation. Nowhere do I see any headway being made by the international or any community towards the EFFECTIVE on-going protection of wild tigers or wildlife, of forests or oceans, of the planet's climate or ecosystems or of civilization itself--since Man cannot survive where Nature and wildlife dies. I see the absence of will. The failure of intelligence and of leadership. The dearth of vision. Eating the cake is what I see us doing; the appearance of safeguarding is what I see us seeking. What was true of many an ancient civilization, from the Sumerians through the Romans and Mayans, remains true today: we are blinded by the status quo, by wants, needs, interests and petty concerns. But there is more. We're hemmed in by helplessness and FEAR. There are too many of us, and we're at a loss to reduce our numbers and take ourselves out of the mess we're in. Yet, as long as humans continue to breed out of control, as long as human activities continue to expand out of control, no space, species, habitat or ecosystem will remain whole or healthy, safe or protected. For wildlife or for humans. Rats in a crowded pestilential cage, we're already at each other's throats! Plunging towards suicide, as others before us have been, we remain as blinded as they. Thus, we too will reach the end of the road we travel. I think the real problem is not the conservation of wild tigers and the effects that tiger farms have on such conservation but rather the conservation of tiger habitat. The greatest threat to most endangered wildlife is not illegal hunting but the protection of habitat that is under pressure from local farming, development and subsequent pollutions. The farms can have clear benefits for conservation efforts by providing a ready source of animals for wild release programs so long as there is suitable and protected habitat available to release them into. Just saying that the farms must close will create nothing but anger unless a suitable and attractive exit solution is provided to the people who have invested so much in them. The ideal solution would be to just slowly buy out the farms for conservation purposes and convert them into tiger sanctuaries producing animals for wild release programs. China does great things for the panda, but I've never seen much that indicates that they're as respectful to the rest of the animal kingdom. Farming tigers and bears for medicinal purposes, skinning dogs, cats and other animals while still alive for the fur trade, cruel 'entertainment'...the list goes on. People, like me, who dream of a better world where the natural world is cherished rather than destroyed, hope that the likes of EIA can succeed in their missions. There will always be the ignorant, the apathetic and the uncaring, but the hope that compassion and conservation can triumph in the end is the only hope we have. We need open space and forests in the world for tigers to be free. 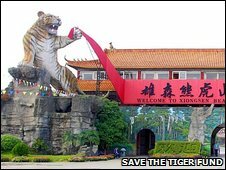 The thought of tiger farms make me ill. These beautiful animals need our respect and love. And must not be breed in captivity for weak-minded people to use them for profit in potions and whatever. We all need to respect each other on the planet - human, animal and plant...China needs to understand this the same as the rest of us. I have no knowledge about headway being made but if there is a thriving black market, that indicates demand exists. If the demand exists what does that mean in terms of international community's success protecting the tiger. I believe that if tigers are farmed for body parts that greed will acclerate the supply side. One day, with most wildlife in the world extinct, there will perhaps be a market for humans as in the novel and movie, "Soylent Green". I am and will continue to be an active financial supporter of "Save the Tiger Fund". The use of tiger derivatives should be outlawed. To me, tiger farms encourage the use of tiger parts and derivatives. The efforts and money should be put into maintaining a healthy tiger population in the wild. The world without the wild tigers is unthinkable and utterly sad. The tiger is one of the last remaining animals on Earth that has the power to inspire that primeval awe in mankind that inspires us to want to be more powerful, more courageous, more noble. To let this animal go extinct would be to lose a very old friend, as a species. To farm the cats is almost more insulting to them than letting them go extinct. China's lack of action against the interests farming them is disgraceful and highly disappointing. Those still in captivity should be seized and gradually introduced into conservation areas in whatever is left of their natural habitat. In China if possible. If not, then in India, Nepal, and other south asian nations. I do not agree. (1)it is not true that "the future of the tiger and its jungle home are inextricably linked to the survival of all of us". The reality is that if the tiger became extinct in the wild, that would have no practical effect whatever upon anybody in the developed countries. Moreover (2), the sensible solution to the idiotic Chinese demand for tiger parts, is to farm tigers; that's utterly and blindly obvious. Just as farmed salmon displaces wild-caught salmon, so farmed tiger will naturally displace wild tiger. The important point, is that the tiger does breed well in captivity. You will never change the Chinese desire for traditional medicine quack nostrums, but you can find a sustainable source for the materials. More power to the breeders' elbows!